how do I go from this [Google Form] to an OPML file that feedwordpress can use (also if you have any ideas about how to do autodiscovery of feeds so if people only put in their main url it’ll find the feed, that would be great). With this a person can enter their blog url, some code tries to fetch the rss feed and uses the data to generate an OPML file. If you’d like to see it in action fill in this form (embedded below) … and see the generated OPML here (this should update every 5 minutes. It’s also *.tsv but the URL is enough to trick most feed aggregators). I’ll let you discover uses for this template other than open course registrations. I am not sure why you are fiddling with the OPML. You should should copy the URLs and paste them into FWP. I’m assuming Martin had assumed that generating a OPML file accessible by url would mean FWP would keep checking for new blog registrations. As Martin has subsequently discovered this does not appear to be the case. When you import feeds from a url FWP still prompts you to select which feeds you want to include. This suggests to me that it’s not a fully automated process. Alan suggested just copying the urls into FWP. Lets look at how that works. 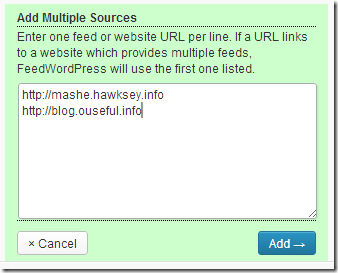 Clicking the ‘add multiple’ source button in the FWP admin lets you dump a blog url, one per line. When you click add FWP visits the blog and tries to auto-discover the feed using the first RSS feed it finds (this is the same trick used in my Google Form). So in short as FWP doesn’t appear to keep checking the OPML file and because you can just dump blog urls Martin may as well just collect these and do any cleaning up after. One last plea – I joked with Alan that I needed DS106 out of a box. I think I’m serious though – it would be great to have a step by step, idiots guide to installing and setting up a DS106-like environment. The rest of us don’t have Alan and Jim’s tech skills, so getting to the starting line is difficult. I know they’ll say you should invent your own way, but they done so much great work that I don’t think they realise just how much expertise they have. A simple installation that let the rest of us get started, would mean we could all go off in different directions then. Thanks for updates Martin – it’s one of those things I thought someone would have a simple solution for, but actually turns out to be quite tricky. I’m sure a day of Hawksey/Hirst magic would fix it though. This is very interesting! I’ve struggled with feed aggregation for a long time in my courses and have used all sorts of feed aggregators. What I would like to have is a simple form (such as the one you’ve made) where the students themselves register the feed which contains the course related posts. At my department we are having students taking more than once course at a time which is why we tell them to create a specific category (or tag) for each course. E.g. http://myblog.wordpress.com/category/courseX/feed/. This is where I run into trouble. If I would ask the students to add the course category URL, the feed autodiscovery feature in your script will only identify the main feed. I’ve solved this problem by adding an extra form field for the course feed, which means I’m really not using the autodiscovery feature. That’s fair enough. My next problem is a bit worse. Since the students are supposed to follow each other’s work, I would like to provide them with a combined feed with posts from all feeds registered in the OPML file. I could import the opml into my personal Google Reader account and share a combined feed from there. But the problem is that Google Reader won’t poll the opml file for changes. Is there a way to get a combined feed that regularily checks the opml file for updates? Yahoo Pipes! should be able to do this but I haven’t been able to make it work. Hi Peter, Sounds like you’ve got as far as I did. I did play around with having a list of feeds on this sheet, which get aggregated together in batches using this Yahoo Pipe used in Col C. I then tried combining the rss feeds from these pipes in this one to give a single feed. I was targeting on aggregating 1000 feeds this way but hit Yahoo Pipes 30 sec timeout. Links from col C seem to work and follow a url pattern so you could share these?